Shaded Patterns - Zombie Pumpkins! I would love to see Ryan try his hand at a few shaded patterns. I think they would turn out great! I might try some shaded pumpkin carving for my own personal art. 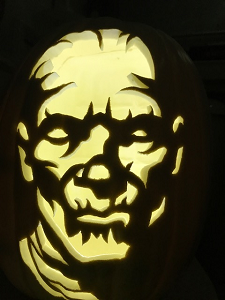 But I think the patterns offered on Zombie Pumpkins will remain the basic cut-out style. I like the idea of keeping pumpkin carving easily accessible to all. Just about anyone can follow one outline, even with the most basic tools.